Are you planning a trip with your baby and are worried about sleeping arrangements? No matter if you are staying at a hotel or with friends or relatives, you have to think about where the baby will sleep. I always bunked mine in with me but it meant that coming home we had to start all over again with training them to sleep on their own. This stylish infant travel bed would have made my life so much easier. Because it has a collapsible frame it folds down easily and is a breeze to carry around as it is lightweight and has a shoulder strap. It is compact enough for you to include in your hand luggage or just throw it in the boot of your car. 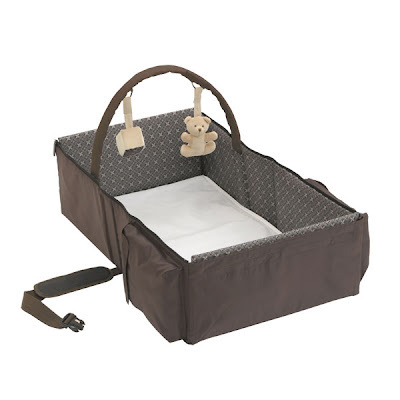 This infant travel bed is recommended for newborn to six months and is padded inside for comfort. There are large storage pockets for diapers and wipes and the nylon surface can be wiped clean. It comes with two soft toys and a fitted sheet to make your life even easier. I love the look of the bed, and it would be the perfect solution if you need a comfortable, safe place for baby to nap.